7242. Elizabeth Tiffany HOOVER (Bertha Alington YETTER , Joseph Daniel YETTER , Samuel B YETTER , Sarah BITLER , Michael , Johannes ). 12764 M i Joseph Michael PAGANO. + 12765 M ii Robert William PAGANO. 7243. Ethel Stewart HOOVER (Bertha Alington YETTER , Joseph Daniel YETTER , Samuel B YETTER , Sarah BITLER , Michael , Johannes ). Ethel married Rocco DONOFLIO. Rocco died on 21 Jul 1971. + 12766 F i Janet DONOFLIO. + 12767 F ii Patricia Elizabeth DONOFLIO. + 12768 M iii Charles William DONOFLIO. + 12769 M iv William Elwood DONOFLIO. + 12770 F v Diana DONOFLIO. 7245. Sara Ann HOOVER (Bertha Alington YETTER , Joseph Daniel YETTER , Samuel B YETTER , Sarah BITLER , Michael , Johannes ). Sara married Frank ELSESSER. Frank died on 25 Nov 1980. + 12771 F i Barbara ELSESSER. 12772 M ii Frank ELSESSER. Frank also married Joan MATTHEWS. + 12773 M iii Philip ELSESSER. + 12774 F iv Joyce Ann ELSESSER. + 12775 F v Margaret Ann ELSESSER. + 12776 M vi Kenneth Charles ELSESSER. 7246. Joseph Yetter HOOVER (Bertha Alington YETTER , Joseph Daniel YETTER , Samuel B YETTER , Sarah BITLER , Michael , Johannes ). 12777 M i Joseph Yetter HOOVER Jr.
12778 F ii Jane HOOVER. 12779 F iii Patricia HOOVER. 12780 M iv William HOOVER. 7248. Robert Nelson YETTER (George Troutman YETTER , Joseph Daniel YETTER , Samuel B YETTER , Sarah BITLER , Michael , Johannes ) was born on 16 May 1927 in Vineland, Cumberland Co, NJ. He died on 2 Mar 2002 in Altoona, Blair Co, PA.
Robert resided in 1930 in Old Egg Harbor Rd, Mays Landing, Hamilton Twp, Atlantic Co, NJ. He was issued a social security number before 1951 in PA. He resided in Mar 2002 in Altoona, Blair Co, PA.
Robert married Helen Louise BROWN, daughter of Elmer BROWN and Louise STEINHEISER, on 24 Dec 1955 in Hazleton, Luzerne Co, PA. Helen was born on 26 Dec 1926 in Hazleton, Luzerne Co, PA. She died on 8 Jul 1973 in Lewistown, Mifflin Co, PA.
+ 12781 M i David Nelson YETTER. 12782 M ii John Mark YETTER. John married Jeanne Marie DENNIS. Robert also married Margaret Louise LEEDOM. 7249. Greyson Troutman YETTER (George Troutman YETTER , Joseph Daniel YETTER , Samuel B YETTER , Sarah BITLER , Michael , Johannes ). Greyson married Mary Ann GARRETT. + 12783 F i Sue Ellen YETTER. + 12784 F ii Beverly Ann YETTER. 7250. Mary Frances RIPLEY (Alma Lucretia YETTER , Joseph Daniel YETTER , Samuel B YETTER , Sarah BITLER , Michael , Johannes ). Mary married John Frederick BARRY. John died on 26 Oct 1982. 12785 F i Leslie BARRY. 7251. Lois YETTER 1, 2, 3 (Edward Joseph YETTER , Joseph Daniel YETTER , Samuel B YETTER , Sarah BITLER , Michael , Johannes ) was born on 17 Oct 1925 in Mays Landing, Hamilton Twp, Atlantic Co, NJ. She died on 12 Apr 2007 in The Lions Center, Cumberland, Allegany Co, MD. She was buried in Rose Hill Cemetery, Cumberland, Allegany Co, MD. Lois resided in 1930 in Hamilton Twp, Atlantic Co, NJ. She resided in Ocean City, Cape May Co, NJ. She graduated from Beall High School in 1943 in Frostburg, Allegany Co, MD. She worked as Clerk with Housing Department - City of Cumberland. She was a member of St. Mary's Catholic Church. She resided in Aug 2006 in Cumberland, Allegany Co, MD. Lois married John S JENKINS about 1950. + 12786 M i Dr Gregory JENKINS. Philip Mark JENKINS 1, 2 was born on 12 Dec 1956. He died on 21 Nov 2006 in Waynesboro Hospital, Waynesboro, PA. He was buried in Sunset Memorial Park. Philip resided in Cumberland, Allegany Co, MD. He graduated from Fort Hill High School in 1974. He graduated with BS - Business Administration from Frostburg State University in 1999. He worked with Manitowoc Crane Group, Grove Division (32 yrs) in Shady Grove, PA. He was a member of Catholic Church. The cause of his death was Cancer. 7252. Edward Joseph YETTER 1, 2 (Edward Joseph YETTER , Joseph Daniel YETTER , Samuel B YETTER , Sarah BITLER , Michael , Johannes ) was born on 6 Mar 1931 in Mays Landing, Hamilton Twp, Atlantic Co, NJ. He died on 8 Aug 2006 in New Hope Assisted Living, Cumberland, Cumberland Co, MD. He was buried in Zion Memorial Park, Cumberland, Cumberland Co, MD. Edward served in the military with U.S. Navy. He worked as Center for Career and Technical Education - Electronics Teacher with Allegheny County Board of Education in Cresaptown, MD. He was a member of SS. Peter and Paul Roman Catholic Church. He was a member of Goodfellowship Club. He was a member of Fraternal Order of Eagles Aerie 245. He was a member of Loyal Order of Moose Lodge 271. He was a member of Fort Cumberland Post 13 American Legion. Edward married Norma L JONES 1. Norma was born on 21 Aug 1931. She died on 28 Sep 1993. + 12788 M i Michael S YETTER. + 12789 F ii Stacey L YETTER. + 12790 M iii Randall K "Randy" YETTER. 12791 M iv Kevin W YETTER. Edward also married Marlene KEATING. 7253. William Cornelius YETTER (Edward Joseph YETTER , Joseph Daniel YETTER , Samuel B YETTER , Sarah BITLER , Michael , Johannes ). William married Margaret Ann "Peggy". + 12792 F i Lisa Gay YETTER. 12793 F ii Kimberly Sue YETTER. 7254. Stuart MCELHENNY (John William MCELHENNY , Hannah YETTER , Samuel B YETTER , Sarah BITLER , Michael , Johannes ) was born on 25 Feb 1925 in St Paul, MN. He died on 19 Nov 1992 in Erie, Erie Co, PA.
Stuart served in the military with U.S. Army from 27 Sep 1944 to 23 Jul 1946. He was issued a social security number before 1951 in WA. Stuart married Marcella Josephine RISKE on 5 Jul 1951. Marcella was born on 16 Jan 1924. She died on 6 Sep 1983 in Erie, Erie Co, PA.
Marcella served in the military with U. S. Army from 16 Jan 1924 to 6 Sep 1983. She was issued a social security number before 1951 in WA. 12794 F i Margaret "Peggy" MCELHENNY. 12795 M ii Matthew MCELHENNY. 12796 M iii John MCELHENNY. 12797 F iv Kathleen "Kitty" MCELHENNY. 12798 M v Patrick MCELHENNY. 12799 M vi Timothy MCELHENNY. 7259. Alice E PARKER [scrapbook] (Anna R MCILHENNY , Hannah YETTER , Samuel B YETTER , Sarah BITLER , Michael , Johannes ) was born on 22 Jul 1912 in PA. She died on 15 Mar 1981 in Hurst General Hospital, Hurst, Tarrant Co, TX. She was buried in Mar 1981 in Oak Grove Memorial Gardens, Irving, Dallas Co, TX. Alice resided in 1920 in 804 Pine St, Kulpmont, Northumberland Co, PA. She resided in 1981 in 908 Statford Dr, Bedford, Tarrant Co, TX. She worked as housewife in 1981. She was issued a social security number . Alice married William Joseph GUSICK [scrapbook], son of Joseph A GUSICK and Ruth WOLVERTON, on 22 Aug 1936 in Methodist Church, Frederick, Frederick Co, MD. William was born on 27 Sep 1908 in PA. He died on 29 Feb 1980 in Irving Community Hospital, Irving, Dallas Co, TX. He was buried on 4 Mar 1980 in Oak Grove Memorial Gardens, Irving, Dallas Co, TX. William worked as aerospace engineer. 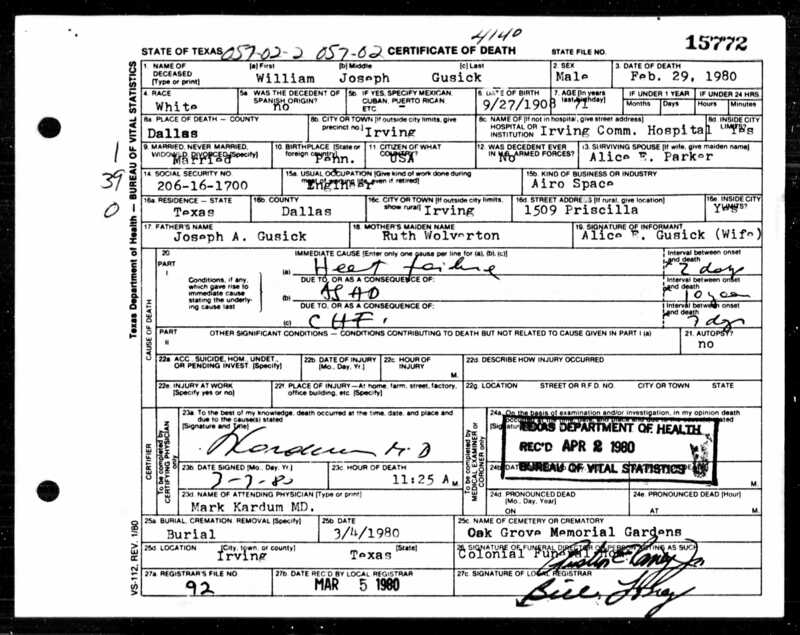 He resided in Feb 1980 in 1509 Priscilla, Irving, Dallas Co, TX. He was issued a social security number . 12800 F i Patricia GUSICK. Patricia married Edwin C SULLIVAN. 12801 M ii Robert "Bobby" GUSICK. 12802 M iii George A GUSICK. George married Pamela J STEWART. + 12803 M iv William Parker GUSICK.